Find out if it's worth it to go on Maui's Atlantis Submarine Adventure. This is your unbiased insider's review and virtual preview of what it's like 130 feet down on one of their subs! 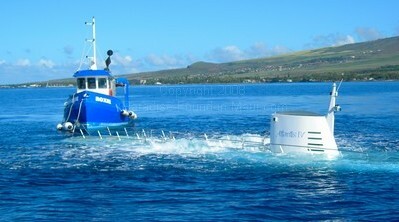 If you want to check out the underwater marine life without getting wet on Maui, you have 2 choices: the Atlantis Submarine, or the Reef Dancer glass bottom boat. If you're a playing the odds kind of person, then you should pick the Atlantis submarine because on average it has way better reviews. Obviously your mileage may vary, but I'm just reporting people's general impressions. Ready for a virtual preview of what you get? Here we go! The submarine is docked quite a ways out to sea, so you'll be heading to Lahaina Harbor where you'll check in, and then take a speedy boat out to the sub. And this is actually a good thing - if the sub were docked in the harbor, you'd miss out on seeing its magnificent gleaming white hull out in the middle of nowhere as it waits for your arrival. I thought it was pretty cool. It let me live out my "secret rendezvous with a submarine" fantasy. Yes, I have an active imagination. Their sub can seat 48 passengers, and every single person gets a front row seat for the view ports inside. This is good news since you won't have to worry about missing out because some 6-foot tall Goliath is blocking your sight line. I present to you, the fish. A Stingray! 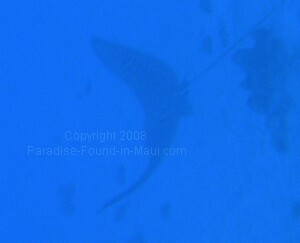 I always think of the stingray schoolbus from Finding Nemo when I see one of these... is it just me? The entire tour is narrated, so you'll never have to wonder what you're looking it. 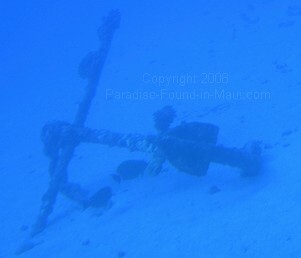 Granted, for stuff like an anchor, you don't really need someone to tell you it's an anchor. 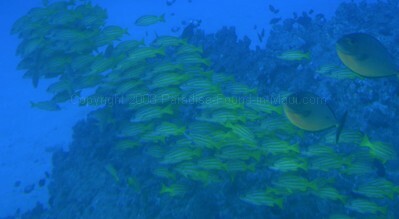 But for the marine life, unless you're a marine biologist, the narration is great, and I think you'll enjoy it - we did! 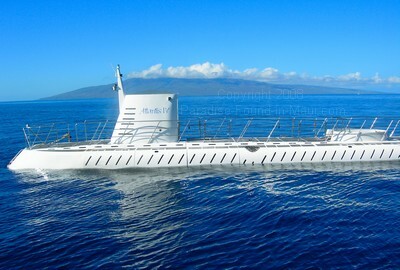 All too soon, it'll be time for the submarine to surface, where it will meet up with The Roxie, a cute little blue boat that marks the resting spot for the sub - due to the shortage of slips in Lahaina Harbour, the Atlantis Adventure sub is always left anchored out at sea. The Roxie, waiting patiently as always! And good thing too! Remember my "secret rendezvous with a submarine" fantasy? Now I see that it was only possible due to a slip shortage. We all know you can't have a secret rendezvous with a submarine if it's parked in plain sight in a public harbor, right? RIGHT? 1) We found it really tough to find parking in Lahaina that was close to the harbor. Make sure you allow yourself lots of extra time for finding a good spot. Alternatively, you can park further away as long as you budget time for the walk - of course, given the beautiful Maui weather, a walk through Lahaina wouldn't be such a bad thing now would it! Just bring some cold drinking water with you to keep hydrated. 2) Allow yourself lots of time to find the boat departure slip. We normally don't have much trouble finding our way around, but we had a lot of difficulty finding the correct slip for Atlantis. Maybe it's just us though. We ended up asking for directions from some folks that were on another boat and had no problems after that. 3) There are no drinks, food, or restrooms on the submarine. We brought along a bottle of water in case we got thirsty on the tour, but since the tour only lasted 90 minutes, the lack of these amenities wasn't a problem. 4) Especially if you have your heart set on this particular Maui adventure, make sure you book your reservation in advance, as space can fill up quickly! Is Maui the Only Place You Can Go on an Atlantis Submarine Adventure? Atlantis operates these submarine tours at several sites throughout the world, all located either in the Caribbean, Hawaii, or Guam. I figured I'd mention that so you know that your Maui trip isn't going to be your last chance to check them out. You have options. When Is the Best Time of Day to Go on an Atlantis Submarine Tour? There are a ton of times to choose from, so it's easy to book your tour whether you're an early riser, or someone who likes to sleep in. I suggest you book your tour for the afternoon. Afternoons are often too windy for maximum enjoyment of the beach, and too hot for hiking. But in the sub, you'll be in air-conditioned comfort. Plus, an afternoon tour means you get to sleep in and have a leisurely breakfast. You are on vacation after all, right? Can Kids Go on the Atlantis Submarine Adventure? If you have kids, I think they will definitely love it - the only catch is that any children would need to be at least 36" tall, and be able to climb down a ladder to gain access to the interior of the submarine. The ladder isn't crazy tall tall though, so don't worry about it as long as your child is tall enough to meet that 36" cut off. An AMAZING Video - They Saw WHALES! While Submerged in the Sub! Ok, so I totally get that that sounds really hype-ey. But seriously, this is one of the coolest videos I've seen in a long time. I know, odds are this won't happen to you, but that's all the more reason to watch the video - at least you can live this incredible experience vicariously through them, right? Every time I watch that video I find myself grinning from ear to ear. It is just. that. cool. Where's the Best Place to Book Tickets? If you're interested in going on a submarine tour like we did, you can get more information on Atlantis Adventure pricing and reservations on the Barefoot Tours site. When you get to their site, scroll down until you see the link for Maui. Click on it. Then scroll down until you see "Submarine and Glass Bottom Boat Tours." All of your Atlantis ticketing options will be laid out for you there. I use them and have never been disappointed - I love their service and friendly staff! 1) Whale Watching in Maui: Tips to Make it Unforgettable! 2) To read more about our adventures in Maui, click here to see our Top 10 Things to Do in Maui for Adventure! 3) Like the idea of going underwater? How about underground? 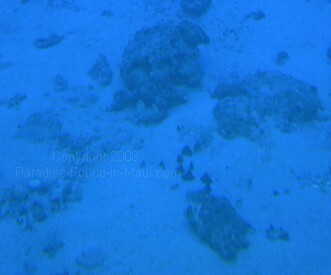 Read all about our underground Maui adventure in Kaeleku Caverns (a.k.a. the Hana Lava Tube)!